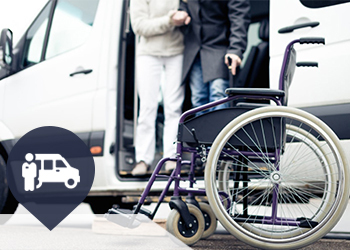 A-Para Transit has provided special needs student transportation services since 2005. Our school transportation resume includes five separate municipal unified school districts encompassing diverse socio-economic demographics. For both public and private schools, A-Para Transit offers student transportation solutions that prioritize safety and dependability for students with special needs. We match our various vehicle types to best suit your student transportation requirements. In addition, we strive to provide students with consistent drivers through the school year to help maintain excellent service quality. Utilizing state of the art technology is one of the ways A-Para Transit provides exemplary service quality. Our vehicles are equipped with AVL/GPS devices, which allows our dispatchers to pinpoint the exact location of our vehicles. In addition, each vehicle is equipped with a mobile data computer (MDC), which gives drivers a map of their pickups as well as audible turn-by-turn directions. The MDCs also enhance communication between dispatch and drivers, thus simplifying the process for making route changes in real time. Also, our specialized scheduling software creates extremely efficient and productive routes. A-Para Transit separates itself from our competition by our understanding of, and commitment to, transporting special needs students. We provide comprehensive driver training and service monitoring in order to ensure service excellence. Before a driver can transport a student, they must pass a background check and a pre-employment drug test. In addition, all drivers are subject to random drug testing. A-Para Transit believes in data transparency and open communications to establish a mutually beneficial business relationship.